Candidates for the Clark County School Board and Nevada Board of Regents tackled teacher retention, funding and accountability in a forum at the Public Education Foundation in Las Vegas on Monday. Much of the discussion for the four School Board candidates in attendance focused on teachers, as they fielded questions from Teach Plus Nevada teaching fellows. District F candidate Danielle Ford said teachers don’t feel secure or like they belong. Candidates largely agreed on the topic of adequate education funding, saying they support funneling marijuana and room taxes toward education. But they differed in how to push for that money. On improving student outcomes, District D candidate Irene Cepedahighlighted the role that leadership plays. She attended both Herron Elementary and Von Tobel Middle School, but noted that one has five stars in the state’s accountability system while the other has one. School Board candidates listed various topics as their top priorities. For District G candidate Linda Cavazos, who currently holds the seat, morale is a pressing issue. She also noted a need to bring the community together to lobby for funding. Cepeda said she wants to focus on board governance and to make sure the board spends more time on student achievement. Miller, meanwhile, highlighted the need to study higher-performing schools and spread their practices throughout the district. Ford championed an expansion of vocational training in schools. Incumbent Trustee Kevin Child, who will face Cepeda in the November election, and newcomer Ryan Scalia, who will face Cavazos, did not attend. Two candidates for the Board of Regents — District 12 candidate Amy Carvalho and District 1 candidate Jo Cato — both highlighted the need to bridge the gap between K-12 and higher education. To strengthen community colleges, Cato suggested working with the business community and launching apprenticeship programs. To hold higher education systems accountable, Carvalho said that regents should follow graduates through their careers and make sure that they are employed. Funding, she said, is another aspect of accountability. “We can’t continue to fund institutions that don’t produce the graduates that we need,” she said. Cato said institutions need transparency, leadership and stability to maintain accountability. Opponents of Cato and Carvalho — Laura Perkins and Andrew Coates, respectively — did not attend. 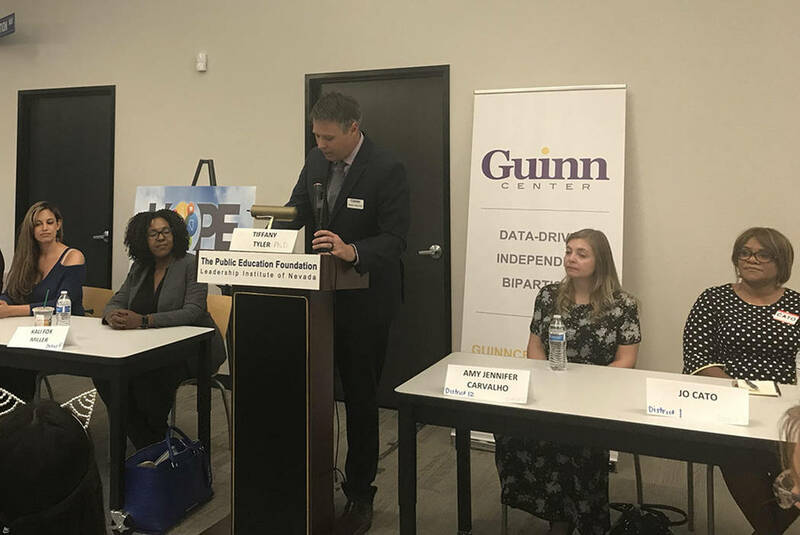 The forum, sponsored by the Guinn Center, Hope for Nevada and the Latino Chamber of Commerce Professional Mujeres Group, will be followed by another in Reno on Oct. 3.